Jonny Sayers was looking concentrated and trying to find James Haigh in the binoculars 800 meters away so that they could sight a straight line over the distance and tell the rest of the team where to put the guide string that was essential to the sand drawing. Communications were being zipped down the radios but we seemed to be having serious problems. There was an uneasy tension in the air. Jonny turned to me: “It’s not working Jamie, they’re putting down the string, but because it is so long it’s not keeping straight and is blowing away in the wind.” The whole process was taking far too much time and we were already behind with it. Without a base line, all the measurements of the drawing are flawed and it is pretty much ruined. The sea was humming with an 8ft swell, reminding us that it was still there and would be turning around in three hours to pursue us. It was now 11am. “Yes….we’re having problems with this baseline Jamie” James is not easily perturbed but I could feel the urgency in his voice. I paused, taking another thought on what I was doing, I pressed the receiver, “Yes, send everyone back, but you stay where you are.” At this moment I saw an attractive young woman hovering behind me. I had seen her on her telephone earlier and Andy Firth who is our new technical manager had identified her as our contact from Island Records. I had not yet met or even spoken to her as Andy had taken care of everything whilst I was in Holland. 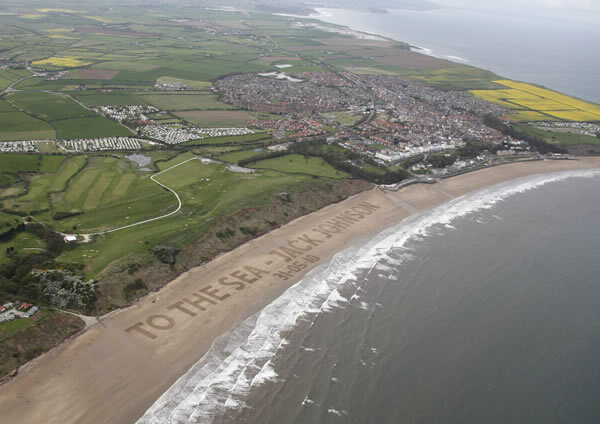 She was the person who was commissioning the project and who had hired a helicopter to take a photograph of the image on completion that would read TO THE SEA – JACK JOHNSON, with the release date beneath. “Jo, get your drawing materials together, sticks, rakes, measuring tapes and guide lines.” She nodded with her characteristic enthusiasm and went off with Jason to gather her weapons. The drawing phase had begun. It was not a surprise to me when I saw that this too was too slow. Jo is extremely talented, but I had laboured her with a method that relied too much on guide lines and measurements. I glanced around to see how the base line was going; currently the whole team except Jo’s was absorbed in it. It was now 11:30 and we should have started drawing an hour ago, low tide was at 14:20. Each letter now needed to be made in only half an hour, a frightening task. I looked on at Jo and Jason, with determination they cracked on, but the speed in which they could work seemed futile; we would not finish the drawing in time. All this use of measuring tapes and pink lines was slowing things down. From this point on the tables turned. Jo rapidly took charge of the new technique and promptly finished the letter T with ease. I was finally able to awaken the dormant beast of the tractor that had been waiting quietly for its moment in the shade of the cliffs. With a nod to its master the tractor roared into life and drew up its mighty form beside me with its giant rake in tow. The master opened the door and I said “Just rake between the lines.” The master nodded, closed the cab door, and with a roar the tracker sped off and began to paint between the lines, tearing up the beach as it went. We were over an hour behind, but the first brush stroke had been made. I grabbed my rake and began to make the letter E. Afterwards, I called on the radio to have everyone return to me once the baseline had been completed. The great Mark Yates and his team had already begun the letters that had curves using an entirely different technique and this at least was a great success. They were flying along in their steady way. Soon Warzier Mirza, Andy Firth and Andy Moss returned to me. I showed them the new method. The look of despair that had painted our faces earlier was suddenly replaced by hope and the realization that we did have a slim chance of doing this. “That’s a piece of piss Jamie!” cheered Andy Moss. “It is, forget the strings and measuring tapes. Just draw.” I was fortunate at this point also by the people I was surrounded by. In times of hopelessness some people will simply give up on a project that is seemingly doomed to failure, whereas others will simply get on with it in the hope that I or another will think of something and that we will prevail. I am a very lucky man as my team is full of these kinds of people and it is a quality that I look for in a person. To this end we had not lost too much time and our new methods could save us. “Jamie, I’m worried about this tide”. This I could see on his face as I came closer, usually so calm Andy looked genuinely worried and strained. I clipped the radio onto my belt as we came into shouting distance. “Me too, the tide was due to turn only ten minutes ago, but it looks to have done so earlier. It is definitely coming in now.” The race was on; our great moon orbiting 384 thousand kilometres away was now dragging the sea back up towards us. I looked behind me to see where the tractor was. It was doing a fantastic job and had covered so much ground. My first instinct was that we were doing great but then I looked at the plans and realised that he was only on the end of the first phrase. The sheer size of this image had tricked me, he had indeed done a vast area, but it was in fact less than half of the drawing. “What’s our ETA on this?” asked Andy. “I’m not sure, the sea should stay for a while, but once it turns it will gain momentum and race in.” It was currently only 30 meters away from the bottom of our numbers which themselves had not been completed yet. “We’re on the last one now”. “OK, when you’ve finished I need you to come back over here and begin raking.” It was now all hands on deck. The moments that passed from then on were filled with running around letters with a rake. This seemed futile when we had a tractor, but it was making a difference. I went up to the beast and spoke to its master. “Time is critical now. The sea is only 15 meters away from the numbers and we need to finish these letters before it gets them. At this moment I just need you to rake as much area as you can and we will come after you and fill in the details.” The master made a sharp nod and shut the cab door, off he went. And so on we went, all of us charging round raking full 50 meter letters by hand, Mark Yates breaking his with his efforts. James and Jonny exhausted as they had been cleaning up after the tractor, but still raking on. “Very soon now. Make the call Mr Firth.” Soon, the whole team was on the final letter N raking the sand, only the lone Andy Firth who with his partner Helen had worked so hard organising this whole project was not there. He was acting as guardian against the sea, willing it to stay at bay for just a few moments whilst the helicopter was scrambled; hoping that it would not take the precious numbers before we finished. At this moment I looked around me to the faces of those involved and saw sheer delight and disbelief as we were on the eve of achieving what four hours ago seemed utterly impossible. Although our bodies were aching we raked for the shear enjoyment of it. “WHOOOOOO,” I couldn’t see him as he was so far away, but I feel he was probably jumping with joy at that moment. Whilst the helicopter buzzed around we made our way up the cliff to get a glimpse of what we had achieved. On the way up I saw Olivia again with a chap I assumed to be Scott. I had heard lot from reading the emails between Andy Firth and them but had never written or spoke to them directly. This is testament to my faith in Andy and Helens ability to run a project with me quietly directing in the background and making plans. There is no way that this project could have gone ahead without them, I would have simply had to have said no as I was in Holland and couldn’t have prepared for it. It is great to have a team. Not just for the practical element, but for the fact that we are able to so readily bounce ideas off each other and encourage one another. Oliva and Scott were ecstatic by what we had done, and the photographer in the helicopter couldn’t believe what he saw when he came over the horizon. After shaking hands and saying goodbye we paced up the rest of the hill. The whole team was already there looking onto our work. I looked over Jo’s shoulder to see our work. I could only make out the last three letters of Jack Johnson’s name, not because Jo was in the way, but because it was so big. S O N is all I could read. Incredible. 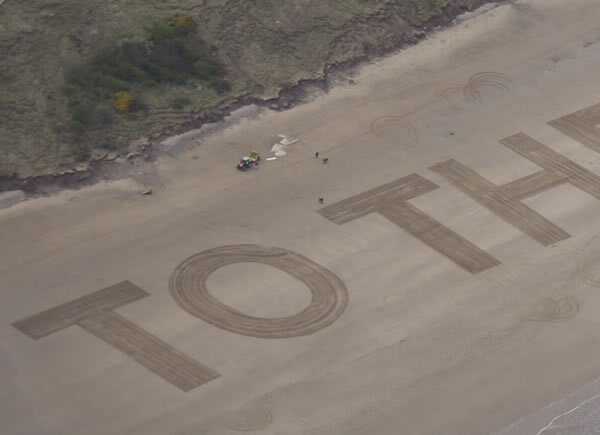 Even though we faced difficulties, we had revolutionised the way of drawing in sand that day. We have moved onto a new level where the image is so big that you can no longer see the people on the ground, even the bulk of the tractor is hard to make out. I also learnt a clear lesson brought on by severe pressure. If the method you are using is not working and will not achieve what you need to achieve, then you must stop using your time on it and think of something else. To the Sea! and to everyone that was involved! The sandinyoureye team. From left to right: Ra Horgan, Richard Bottomley, Jamie Wardley, Andy Firth, Jason Lynn, Jo Billingsley, Tim Curtis, Jonny Sayers, James Haigh, Mark Yates, Warzier Mirza, Goran Namiq, Andy Moss. And not featured, Helen Tidswell, Finn Varney, Louis Waller, The Munson. By the way, I think this was the biggest beach sand drawing in the world. Heads up on that one if anyone know different.